Tathagata Satpathy, a four-time BJD MP from Dhenkanal in Orissa, has been unsparing lately in his criticism of the Narendra Modi government over the Aadhaar project. He tweeted up a storm this week, alleging that a party colleague was trying to swing a deal with the BJP and split the BJD. He didn’t name anybody, but Jay Panda, another high-profile BJD member, reacted sarcastically. 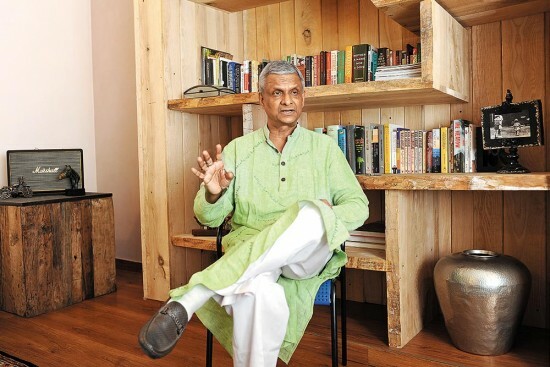 As the row got political circles talking, Satpathy spoke to Bula Devi on a wide range of issues. You tweeted that BJP was trying to divide your party. One of your own colleagues was helping swing the deal, you said. Who did you mean when you said this? I don’t want to speak about my tweets. But one should mark my last word ‘Ha’ in that tweet. I only wanted to flush out critters. Nothing more. You have flagged that Orissa assembly polls may be advanced, and held with upcoming elections in other states (Gujarat, Madhya Pradesh, Rajasthan). Are you worried that mood in the BJP-led states can influence election outcome in Orissa too? Electoral funding going under wraps is undesirable. One won’t know why our elected representatives and the government are acting in certain ways. I am not worried. For, (chief minister) Naveen Patnaik’s popularity is still intact. I was thinking about it aloud and I tweeted. I found it ridi­culous when our PM suggested holding simultaneous elections. Does he understand the financial implications by conducting all elections together? He wants to advance the Gujarat elections for obvious reasons. The Finance Bill 2017 has provisions for political funding. Amendments were brought in as money bills. What do you have to say about it? The finance minister had, in his speech, said that 70 per cent of funding of political parties was done by cash and the rest by cheque or similar means. It means only 30 per cent was coming under the purview of legitimate transactions. The new scheme of things all­ows the possibility of unknown entities—whether from within our borders or outside—to ask their banks incognito to transfer some amount into the accounts of political parties, which would get money as bonds and can thus redeem it. It is like a gift cheque that you don’t know who gave. That way, the sources of this 30 per cent can also remain unknown. The government has been telling us that electoral funding will be made more transparent, but in reality they have made it more opaque. Its impact on Indian polity? Foreign companies will now be able to make clandestine, incognito donations to political parties they think might win. Once the party comes to power, they will be able to lobby for alterations to laws in ways that will suit them. And, people will not come to know in whose favour laws have been passed. Therefore, this will be backdoor lobbying, which I think is unhealthy for a democratic nation like India. If at all they want to permit lobbying, they should open up for it in a transparent manner—and let it be open for public scrutiny. But this way, they are taking it out of the ambit of RTI or judicial inquiry. Is it dangerous? If so, to what extent? It is obviously dangerous if the electoral funding system goes completely under wraps. For, one wouldn’t even know what is happening and why the government and elected representatives are acting in a certain manner. The danger could be to any extent. For instance, the government is saying they will merge small banks and create seven or eight major banks. Two or three foreign companies can buy up four to five Indian banking companies and gradually buy up their banking services. Thus, all our finances, banking services and even the economy will be in their hands. They can twist and turn things (to their favour). Aadhaar is now mandatory to file I-T returns and has been linked to PAN. Why have you been opposing it? I have consistently opposed Aadhaar since the UPA time. We do not know which contractor or subcontractor will have access to our personal data. Micro­finance companies collect a lot of data, not biometric data, of people to whom they lend small loans. Since we are an impoverished nation, we do not understand what happens to that data. These companies are known to be selling the data commercially. Why doesn’t the government give us a personal code, why does it require all my data? If the argument is that it is safest in the modern world for an overpopulated country like India to use something like Aadhaar, then will the government make voting connected to Aadhaar? Will your unique number and fingerprint make you eligible to vote through your computer or mobile phone? No, they wouldn’t, because what will the political party workers who herd voters to the polling booth do then? Whereas, with online voting, no manning will be required, no government official will have to take leave, no police force will have to be deployed and the result with details will be available next day. It is said that I-T officials have got sweeping powers now? Absolutely. Income tax officials can keep everyone on tenterhooks and terrorise people. They will not have to explain. Not even a court can ask them. Ideally if they have to enter a home where there is no commercial activity, then they will have to give a reason. In a country like India, there is enough opportunity for vested interests to misuse this power. How do you compare the BJP government with the preceding Congress regime in terms of its policies on farmers and their land? The Congress was very bad and these people (BJP) are worse. They (the present regime) have, in the past three years, given a more acute angle to everything the (erstwhile) Congress(-led UPA) had started. So both are two sides of the same coin; it will take time for people to realise that I am not joking. The unseen driving forces behind the Congress then and the BJP today are the same. They saw that the Congress experiment failed eventually after a decade; so now they are in a hurry to ensure that things are actually got done. Who are these driving forces? That is for you to figure out. Why do you think the GDP figures are not accurate? There’s government statistics to prove it. If I am not lending out money, how is business and industry growing, the GDP growing? Besides, how do they calculate GDP without bringing in productivity as an aspect? I find it funny. It’s simply jugglery of figures. You seem to be against the Statistics bill also. Why? No, I am not against it. What I am saying is that a nation of this kind cannot solely depend just on statistics. For instance, the Census 2011 pegs us at 1.25 billion. But I am seeing the growth of my state and I feel the population of the country is not less than 1.5 billion. It is not a wild comment although I have no method to prove it. I have seen how census works. So are we factoring that in our programmes? No. When they put population at 1.25 billion, that time also population wouldn’t have been not less than 1.35 or 1.4 billion. Can you explain the Right to protection of speech and reputation bill? In India, defamation is a criminal offe­nce since the year 1860. Drafted by the British, it, again, has a very western mindset. What was their aim when they said ‘thou shall not speak against state or anyone with a fair skin’? If one did speak, they would move against the person—civilly as well as criminally. Now, what I have tried to bring in the Speech Bill I have introduced in Par­liament is to remove the criminality part of it. I am not trying to remove the civil part of it. So the civil implications remain, the criminal part goes away. Question can be that if the criminal part of it is removed, then won’t it make people randomly attack anybody without any basis? No.